Minnesota Challenge Rule: if an event host/tournament director receives a complaint or challenge to a team's roster, that team must produce valid AAU membership. aaugirlsbasketball.org, click on the RULES tab. The handbook contains definitions of attached and unattached athletes, as well as eligibility rules, competition rules, general policies and procedures. Modifications to AAU rules and use of some high school rules are listed under Rules on our main page under the Officials tab. AAU N/T Meltdown Huge Success! N/T Meltdown now a successful AAU National Super Showcase Event. This event is an exposure event held during the last NCAA viewing period for the summer. Now in partnership with Minnesota AAU, the Meltdown increased it's record number of teams and becomes THE Midwest Exposure event to attend in July in the Midwest. 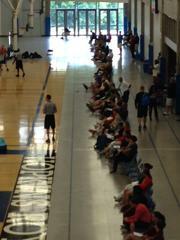 This was extremely well attended by college coaches seeking to recruit outstanding midwest talent. View photos from the tourney.